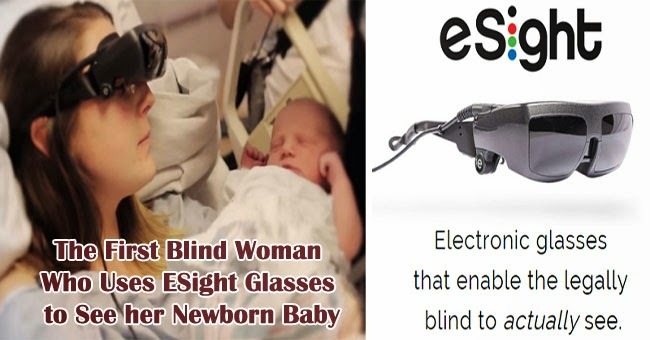 Kathy Beitz is legally blind and when her new baby bot was born, she was given a chance to see him for the first time with the specially developed glasses called eSight. The prescious moment had been caught on camera and now catches the interest of netizens as it reaches more than 800 thousand views in just four days. The 29 year old Beitz became legally blind as a child after suffering from genetic macular degeneration. She was able to have a career and family despite her blindness, but the moment her bay was born, seeing him was one of the best moment in her life. Beitz shared that her son is the first baby she had ever seen and it made the experience very overwhelming. She was amazed to see her son’s toes and lips which she said may looked like hers. eSight is a wearable hands-free electronic glasses that is said to be the only technology that lets the legally blinds to actually see their surroundings. It is comprised with display technology, a camera and a advanced computing to deliver the images in real time. The users can actually adjust the image depending on their preference. For people who had been legally blind, the ability to see things and do certain tasks like those who can actually see is an amazing experience. Yvonne Felix, Beitz’s sister is also legally blind and through fundraising was able to get her own eSight. The one Beitz used in the video was only loaned to her and now Felix is fundraising for her sister to own one. #MakeBlindnessHistory is a fundraising project in which Felix is a part of. The project aims to purchase an eSight for one legally blind at a time through the money donated to them.